To download your own copies, launch iBooks, tap on “Store” and search for “Apple Developer Publications” where they’ll all be listed. Apple recommends grabbing the latest iBooks 1.2 update before downloading the free books. Due to the iBooks requirement, you’ll need either an iPhone, iPad, or iPod touch to download them for now, although I wouldn’t be too surprised to see iBooks come to the Mac when the Mac App Store is released next month. Considering the high cost of iPhone app development, grabbing a few free books and learning on your own may be the best way to have an app idea come to fruition. Oddly, the availability depends on the country. Here in nl for example (where ibooks still only features free books anyway), only 5 of the 6 titles are available. Still very useful though! pdf is ok, but epub offers some nice features if you pull them out of ~/Music/iTunes/iTunes Media/Books/Apple Developer Publication (sync books first) and open them with an epub reader (e.g. Adobe Digital Editions). 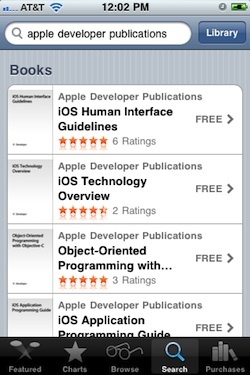 Can somebody PLEASE mail the “iOS Human Interface Guideline” ebook to my email? mitchcosta@me.com I can’t download it and i’m starting an app! Huge thank you! iOS Human Interface Guidelines not available in neither Belgian nor UK store. Anyone having trouble downloading some of the books from the iBookStore just grab them from Apple’s website. You can do this from your iPad directly, or your Mac/PC by save as PDF, then save them to your iDevice. Hi, I am unable to locate in iBooks looks like they have removed. Is it country specific..I live in India? Thanks.